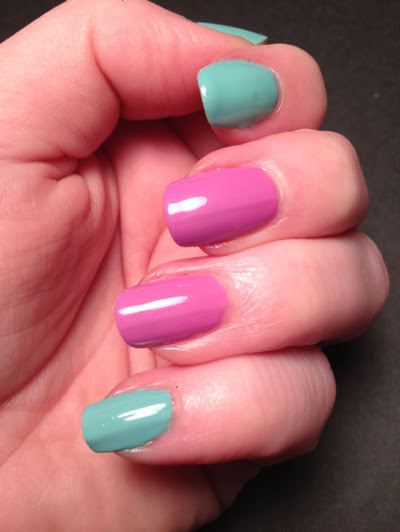 I know it's late in the day but I wanted to share a wonderful mani that I recently wore, with you. I recently found a Walgreens when I was out of my usual area ( I don't have one remotely close so it was a treat). I saw the Sinful Shine display and knew I had to grab some to see how they were. I picked up Rendezvous and Pragmatic. 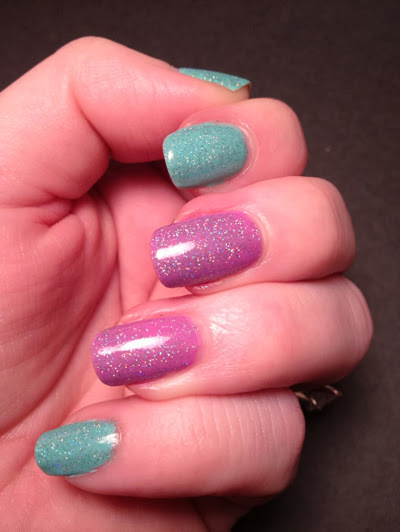 For those of you who don't know, SinfulShine is a line of polishes from the Sinful Colors polish company. It is supposed to have high shine and gel technology all rolled into one polish. I wish I would have gotten to find that out, the shine that is, maybe next time. Rendezvous was a nice light teal, a sort of Tiffany-ish blue and Pragmatic was a nice lilac. I applied a couple coats over Duri Rejuvacote and used no topcoat to try to see how the finish was. Well apparently I fell asleep before they were 100% dry and I sadly woke up to blanket marks. I did get some lovely pictures before they got messed up. Obviously when I woke up I was sadly disappointed. BUT, all was not lost. I had the perfect topper. 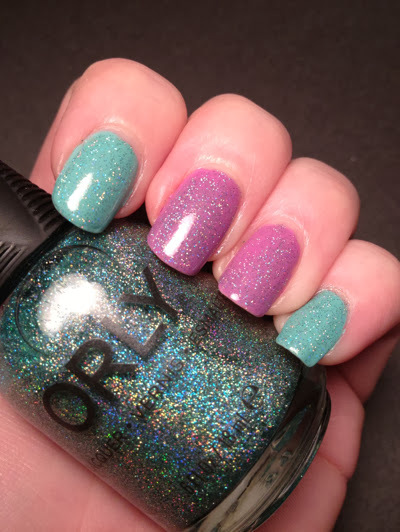 Orly Sparkling Garbage!!!! A quick coat of that followed by some Glisten and Glow HK Girl Topcoat and i was happy again. It was so perfect! I was able to wear this at least three days without chips or wear. I was really impressed with how well such a cheap polish held up. I meant they we're only $1.99, on sale! You can find Sinful Shine at your local Walgreens and Orly online or at your local Sally Beauty.